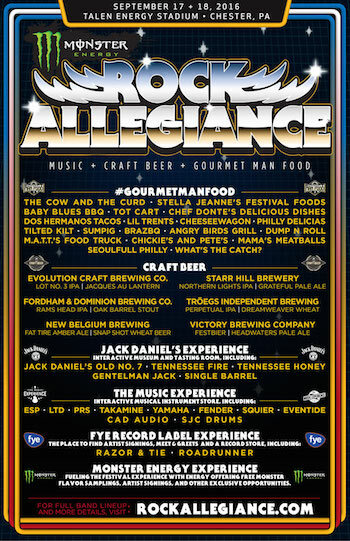 The Gourmet Man Food lineup, craft beer selections and daily band lineups have been announced for the second annual Monster Energy Rock Allegiance, September 17 & 18 at Talen Energy Stadium in Chester, PA, just outside Philadelphia. 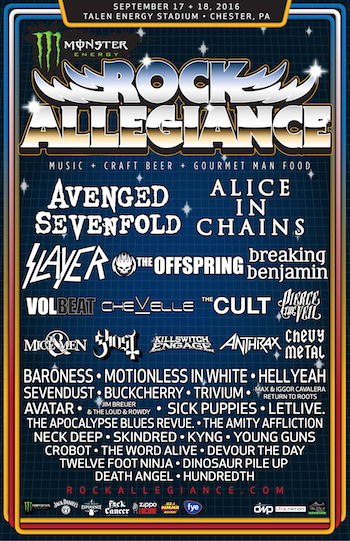 Monster Energy Rock Allegiance will feature a lineup of over 35 bands on three stages, led by rock heavyweights Avenged Sevenfold and Alice In Chains, along with Slayer, The Offspring, Breaking Benjamin, Volbeat and many more. Last year's single-day debut shattered Talen Energy Stadium's previous attendance high by nearly 10,000 people, with over 26,000 total in attendance, prompting festival organizers to expand to two days. Weekend General Admission and VIP tickets—as well as a limited number of single day tickets—for Monster Energy Rock Allegiance are available at www.RockAllegiance.com. Festival doors open at 11:00 AM each day. Monster Energy Rock Allegiance is proud to support beer entrepreneurship with a celebration of local breweries and specialty drafts hailing from throughout the nation. The roster of regional and national craft beers is as follows: Evolution Craft Brewing Co (Salisbury, MD — Lot No 3 IPA, Jacques Au Lantern) • Fordham & Dominion Brewing Company (Dover, DE — Rams Head IPA, Oak Barrel Stout) • New Belgium Brewing (Fort Collins, CO — Fat Tire Amber Ale, Snapshot Wheat) • Starr Hill Brewery (Charlottesville, VA — Grateful Pale Ale, Northern Lights IPA) • Tröegs Independent Brewing (Hershey, PA — Perpetual IPA, DreamWeaver Wheat) • Victory Brewing Company (Downington, PA — Festbier, Headwaters Pale Ale). Monster Energy will be keeping all fans fueled up and ready to rock by offering free sampling on their Monster Energy viewing deck. Enjoy Monster Energy drinks from one of the best seats in the house. Make sure to check back throughout the festival for a schedule of Monster Energy's interactive artist experiences. "Taste of Tennessee" invites visitors to come out and tour the nation's oldest registered distillery from outside the Jack Daniel's Hollow. Visitors get to see (and smell) whiskey dripping slowly through charcoal and the new oak barrels used in maturing Tennessee's finest whiskey. The Jack Daniel's Experience is open to all fans, 21 years old and up, for tours free of charge. Stop by the Jack Daniel's Experience for interactive engagements throughout the weekend. Zippo Encore will offer a full stock of Zippo lighters, including the limited edition festival designs. Come by and check out their contests and giveaways or get a free lighter fill or tune-up. Be sure to bring your Zippo lighter to the festival, it could be your ticket to special experiences. The Music Experience features all the elements that are involved in making music in a professional band setting. The interactive exhibit features guitars, basses, amps, drums, keyboards and electronic gear that are used by today's most popular bands. The Music Experience has autograph signings and artist interactions throughout the day. Check Facebook and Instagram for the latest info on who will be hanging out at The Music Experience. f.y.e. will be hosting the ultimate fan and artist interactive experiences throughout the festival. f.y.e. is the only place at the festival to get all your favorite band's music — and maybe even get to meet your favorite Monster Energy Rock Allegiance performers. Check back for updates on artist meet and greet and autograph signing sessions as well as unique experiences and offers thanks to Razor & Tie Records and Roadrunner Records. Philadelphia Union will be hosting the ultimate Rock N Jock experience at Monster Energy Rock Allegiance. One winner plus a guest each day will receive prizes from the Philadelphia Union, Monster Energy Rock Allegiance and a private Meet & Greet with Pierce The Veil (Saturday) or Breaking Benjamin (Sunday), along with the ultimate fan experience at both the festival and a 2017 Philadelphia Union game of their choice. To enter, visit http://www.philadelphiaunion.com/rock-enter. No purchase necessary. The F C Cancer Foundation's mission is to fight cancer by raising awareness and to educate about early cancer detection, ultimately putting an end to late stage cancer diagnosis. The Dyin 2 Live wish granting program looks to enrich the lives of those fighting cancer by offering them an experience that will bring joy, hope, inspiration, and courage into their lives. In doing this, the program hopes it can help give the cancer fighter a chance to forget, even if it's only for a day, what they are battling. The hope is that it can be used as a source of inspiration to those needing a brighter day in their darkest hour. Sharethebus was founded by two individuals from Montreal named Wolf and Kyle. They were fed up with how hard it is to rent a charter bus, and wanted a better way to travel together. In 2014 they started Sharethebus and quickly realized that what they're offering is something that a lot of people want. Today, Sharethebus is a growing team of travel experts, developers, and rock stars who are building the best way for you and all your friends to go where you want, when you want, all while having a blast. The festival is fueled by Monster Energy. Additional sponsors include Jack Daniel's, Zippo Encore, The Music Experience, F.Y.E., Roadrunner Records, Razor & Tie Records, Take Me Home, Fxck Cancer/Dyin2Live, and more.